'What's going on' was written by Renaldo 'Obie' Benson, Al Cleveland, and Marvin Gaye. It was the title track of Gaye's groundbreaking 1971 album. A meditation on the troubles and problems of the world, the song was released as a single to worldwide success. The song has been covered by multiple artists, notably Cyndi Lauper, whose version was released as the third single from her 1986 album 'True colours'. On the album version, the song starts off with a series of gunshots in reference to the Vietnam war, while the single release is a remix with an alternate vocal used in the intro. The single reached number 12 in the US Billboard Hot 100 chart and number 30 in the Dutch Top 40. 'She bop' was, for some, a controversial song as the lyric was full of allusions to masturbation, such as 'They say I better stop / or I'll go blind'. Lauper said she wanted little kids to think the song was about dancing, and to understand the real meaning as they got older. This is probably why the lyric is quite oblique. The single was a top 10 hit in most countries where it was released, although there were exceptions: in the UK it only reached number 46 and in the Dutch Top 40 it only got to number 34. 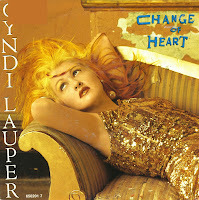 'Change of heart' was the second single taken from Cyndi Lauper's second album, 'True colours' (1986). The Bangles sang background vocals on the track. In the US Billboard Hot 100 chart the single reached number 3. In Europe, audience reaction was much less enthousiastic: in the UK singles chart the single stalled at number 67, whereas it didn't chart in the Netherlands at all. I had to search for quite a long time for this single: when it was released, it didn't appear in Dutch record shops at all. I found a 12" single a few years later, and only in 1991 I found the single. 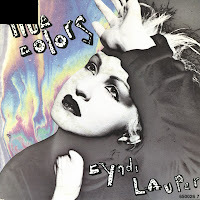 I was a bit shocked when I saw Cyndi Lauper on television this week, performing 'True colours' live in an episode of the soap series 'As the world turns'. There was a time when soap series were considered decidedly uncool, but I guess these days, anything is possible. 'True colours' was written by Billy Steinberg about his own mother. Tom Kelly altered the first verse and the duo submitted the song to Cyndi Lauper. According to Steinberg, 'Cyndi completely dismantled [the original] arrangement and came up with something that was breathtaking and stark.' The single reached number 1 in the US Billboard Hot 100 chart, number 12 in the UK Singles Chart and number 7 in the Dutch Top 40. 'The world is stone' was originally written in 1978 for the Starmania musical as 'Le monde est stone', a French song by Michel Berger and Luc Plamondon. The song was adapted to English by Tim Rice. 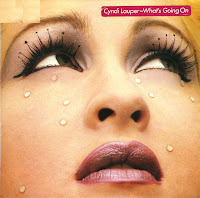 Cyndi Lauper recorded the song in 1992 for the soundtrack of the musical 'Tycoon'. The single was not released in the USA, but it did hit number 15 in the UK singles chart. In France the single peaked at number 2. It also became the biggest selling single in France that year, earning a double platinum certification. 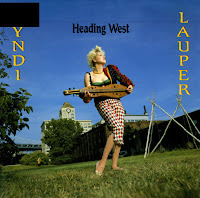 'Heading west' was the third single from Cyndi Lauper's album 'A night to remember'. It was written by Lauper with Billy Steinberg and Tom Kelly. The lyric of the song is about moving on from a past relationship, which was the overall theme of the album. The single became a minor hit in the UK, reaching number 68 in the UK singles chart during a one week chart run. 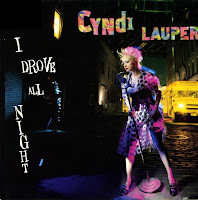 Cyndi Lauper, Tom Kelly and Billy Steinberg wrote 'My first night without you', a song about coming home for the first time without a partner being there after a break up. The single was considered a failure in most of the world because it failed to make a big impact on most charts. However, in South America it was a big success, reaching number 1 in Brazil and Colombia. The track is also a personal favourite of mine. I remember playing it lots of times after I bought it out of curiosity. 'I drove all night' was written by Billy Steinberg and Tom Kelly for Roy Orbison. He first recorded the song in 1987, but it was only released in 1992, after it was a top 10 hit for Cyndi Lauper in 1989. Lauper recorded the track for her third solo album 'A night to remember'. The single reached number 6 in the Billboard Hot 100 chart and number 7 in the UK singles chart. 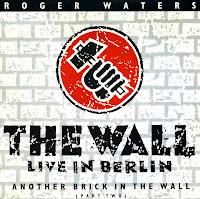 Soon after the wall in Berlin came down, Roger Waters staged a live concert together with a lot of other pop stars, playing the entire Pink Floyd double album 'The Wall'. It was one of the largest concerts ever, with 350,000 people in the audience and 52 countries broadcasting the event live. While earning back the money invested from the sale of the cd and video releases of the concert, the original plan was to donate all profits past his initial investment to the Memorial Fund for Disaster Relief. This fund incurred heavy losses, and when the charity was wound up, the audio and video sales rights returned to Roger Waters himself. 'Another brick in the wall' was the only single release from the concert. It featured Cyndi Lauper on vocals, giving it a somewhat quirky feel. The single did not become a hit. After Band Aid had sold millions of copies worldwide with 'Do they know it's Christmas? ', it was almost inevitable that American popstars would rise to the challenge and come up with their own charity single. 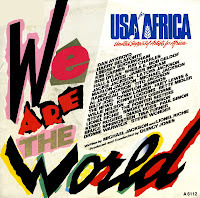 'We are the world' was the result: a single of an epic 6'22 minutes length which is fine for the first three minutes but then turns into a long, protracted death rattle of a song, with far too many artists claiming a few lines of their own to sing. The lyric 'There's a choice we're making / we're saving our own lives' was originally written as 'There's a chance we're taking / we're taking our own lives'. It was rewritten when it was feared the original phrasing's first part might look like the artists are patting themselves on the back while the last part might suggest collective suicide. The single became a worldwide number 1 hit, raising more money for emergency needs in Africa, where several countries were suffering from an unprecedented famine. Not much has changed in over thirty years though: Africa is still in need. 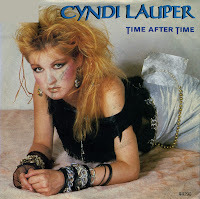 After all the craziness of 'Girls just wanna have fun', Cyndi Lauper's next single 'Time after time' made be breathe a sigh of relief. Indeed, the woman was capable of making a beautiful song as well. She was rewarded with a number 1 in America, while the single peaked at number 3 in the UK and number 5 in the Netherlands. Lauper co-wrote 'Time after time' with Rob Hyman of The Hooters. She indicated much of the lyrics were written about occurrences in the studio and her life at the time. The line 'the second hand unwinds' referred to producer Rick Chertoff's watch which was winding backwards. Lauper re-recorded the song in 2005 as an acoustic version, together with Sarah McLachlan. 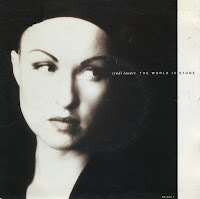 It was included on Lauper's album 'The body acoustic'. I dare say that this is one of the best 12" singles in my collection. 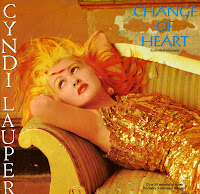 Cyndi Lauper's 'Change of heart' is a very energetic, bouncy song, and the remixes of the track on this record are adding to that vibe. When I bought this record, I was scouring a row of 12" singles in a temporary shop in a building that was about to be knocked down in the centre of Den Haag. For some reason they stocked loads of English 12" singles and they were all made available for ridiculously low prices. The sleeve of this record was a big plus towards buying it, proving that good photography is essential if you want to sell records.